S'well The Sparkling Champagne Water Bottle from the Glitter Collection, inspired by the glamour of old Hollywood, features a sparkled, lacquered finish. 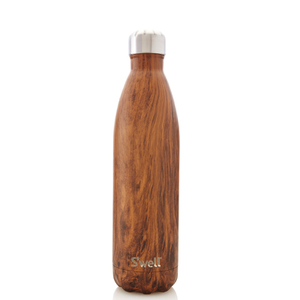 Launched in 2010, S'well water bottles aim to rid the world of disposable plastic water bottles by producing fashion forward, covetable, reusable water bottles. Crafted from vacuum insulated high-grade 18/8 stainless steel, each bottle uses innovative triple-walled ThermaS’well technology that includes a copper layer, providing a condensation-free exterior that will not drip on hands or in a bag. The BPA-free bottles feature a wide mouth suitable for ice cubes and drip free sipping and will fit in most standard cup holders. Seriously hard-working, every S’Well bottle will keep drinks hot for 12 hours and cold for 24 hours, ideal for daily hydration and great for keeping wine chilled for special occasions. Versatile and stylish, each bottle purchased helps to support Unicef.